“Do not buy maps, buy stock in companies that print maps,” Dr. Paul Goble told a group at Los Alamos National Laboratory in November of 1992. Predictions are hard. And few people know that better than Dr. Goble, who worked for the US State Department during the 1980s. Goble was warning people that the end of the Soviet Union was just around the corner and that massive change for the US was underway. But a lot of people didn’t believe him. Until it actually happened. Goble delivered his talk at Los Alamos National Laboratory on November 17, 1992, less than a full year after the collapse of the Soviet Union. By then Goble had moved on from working as a special advisor at the State Department on the non-Russian peoples of the Soviet Union, and was working at the Carnegie Endowment for International Peace. Americans, including powerful people in government, were still trying to make sense of what had happened, and Goble was doing his best to put the possible futures in context for people who had lived their entire lives under the threat of nuclear war between the US and the Soviet Union. He got a lot right, and he got a lot wrong. I filed a Freedom of Information Act (FOIA) request with the National Nuclear Security Administration (NNSA) for Dr. Goble’s talk, titled “Coping with the End of the Soviet Union.” And it’s a fascinating artifact from the year following the collapse of the Soviet dream. I spoke with Dr. Goble over the phone yesterday to get his impression of his talk almost 25 years later. Goble retired in 2004 but still blogs about world affairs at Window on Eurasia. “The tragedy of the American foreign policy of my generation, and I’m 68, is that we grew up and had our worldview formed during the longest period of no border changes in Europe,” Goble told me, referring to the period of relative border stability from 1945 to 1990. “There are a lot of people who have trouble imagining that the borders might change. It’s probable that over the next hundred years we’ll see the emergence of more countries. People have real trouble with that,” he said. During his talk in 1992 at Los Alamos National Laboratory, Goble predicted that eventually there would be over 600 countries that would emerge out of the Soviet Union, which obviously didn’t happen. But there was a massive geopolitical shake-up that we’re still seeing play out today. Goble still believes that change is the only thing we can count on as we move into the future and that the unique period from 1945 to 1990 of relative stability won’t be repeated. “[Americans are] locked into a mindset that somehow borders aren’t changed and that we change things within borders. I’ve always thought that America should always understand, coming from the British Empire, but we don’t seem to have learned very much from that history,” said Goble. What stands out to me about Goble’s 1992 talk is that the American political side of the equation clearly didn’t know what to do after the fall of the Soviet Union. Many people who had worked against this enormous traditional adversary didn’t know how to cope with that loss. With just one superpower in the world over the last 25 years, a death by a thousand cuts (both against and from the United States) seems to sum up the new world order pretty perfectly. Obviously it wasn’t just the next month (December 1992) that would define US-Russia relations, but it shows you just how fresh this all was in the minds of people in both countries. 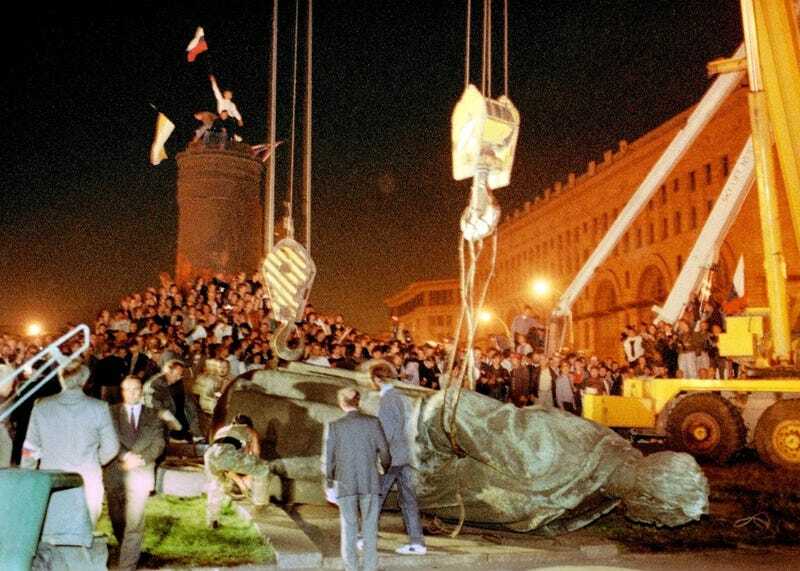 “The end of the Soviet Union is the end of who we thought we were,” Goble said in 1992. During the Q&A portion of the talk at Los Alamos, Goble predicted a number of other global disturbances, including that large portions of Canada would become part of the United States in the near future. It may sound silly to most Canadians today, but it was a prediction made by a number of people throughout the 1990s. And Goble is the first to acknowledge that he was wrong about a number of predictions from that era. But Goble defends thinking about outliers when we’re looking at the future of the world’s borders. “If you looked at the predictions of the 20th century the consensus version is wrong,” Goble says, echoing the main thesis of the Paleofuture blog throughout its 10-year history. I asked Goble about his opinion of the Trump regime and how he thinks it may shake up borders here in the 21st century. “I think the level of ignorance at the top is very high. I think they’re comfortable with authoritarian rulers. Much more comfortable than this country should ever be,” said Goble. And while Goble tells me that he was a Bernie Sanders supporter, he still has optimism that the Trump era won’t destroy the United States. “I didn’t vote for these people, and I’m not very happy with their policies. I’m someone who believes that societies are fragile. You have to take care of societies. We have a bunch of institutions who will limit the impulses of this president. How successful they’ll be, we’ll see,” said Goble. Goble still has confidence in American institutions, which makes me wonder as he’s talking how much confidence the Soviet people had in their own institutions during the 1980s. “I think that the diversity and the size and the complexity of our institutions will make a coup hard. Not impossible but hard. I think the chances are very small,” said Goble.